Hard copies of Burke Centre's Trail Map are available for member pick up at the Conservancy Office during business hours. You will be leaving the Burke Centre Conservancy's web site to view a comprehensive presentation of the Burke Centre trail system as graciously provided by Restonpaths.com/BurkeCentre/index.htm. Burke VRE Trail lies within Pohick Stream Valley Park and provides an important commuting and recreational corridor, connecting a shopping center, residential neighborhoods, and a Virginia Railway Express (VRE) station that also serves Amtrak trains. It parallels the active commuter line for much of its length, a facility known as a rail-with-trail. The trail is paved, largely wooded, and includes one stream crossing. Bike racks, as well as enclosed bike lockers are available at the train station on the trail's west end. The Burke Centre VRE Trails Project was substantially completed on March 7, 2008, on time and within budget. 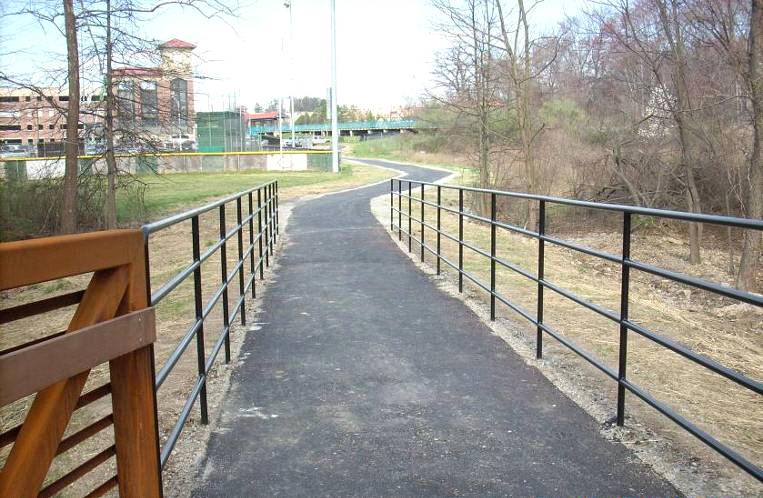 This project included construction of approximately 1,260 linear feet of 8' wide asphalt trail, two pre-fabricated pedestrian bridges, concrete abutments, handrails, and other related items. These trails connect the Burke Centre VRE Station to the Woods Neighborhood in Burke Centre.